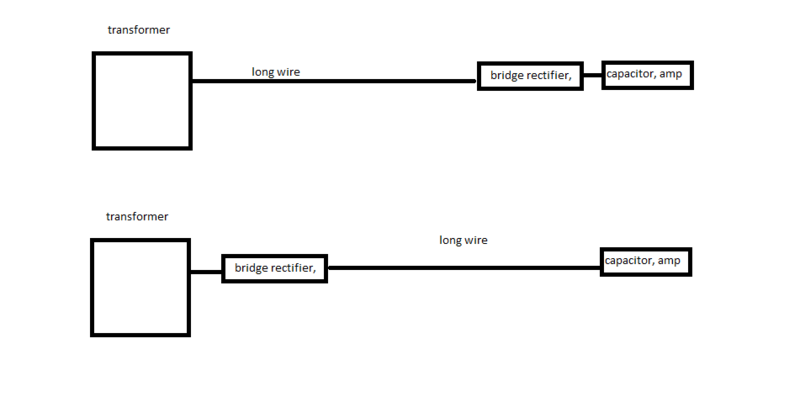 I have a long (2m) but thick wire between transformer-based power supply and low frequency power amplifier. Know your best advice ahead, but no, I cant get rid of it. Looking at some transformer-based PSU's like for mixer equipement I can see a long wire with AC, plus a bridge right in a mixer, but not in the PSU. But looking at SMPS especially for notebooks - they are mostly shielded cables, but runs DC - shottky bridges are close to transformer. With LONG leads between the transformer and the rectifier, lots of EMI will be generated and radiated, as the diodes in the rectifier turn on quickly (microseconds, if not faster) and the rapid change in current thru the long-wires provides external magnetic fields that are very difficult to shield with just copper foil. And place small capacitors (100uF) right by the rectifier. It does not really matter for your use case. I'd still go with putting the rectifier behind the cable, because it leaves you with better maintenance options, e.g. if you want to insert a switch or relay into that cable later. Not the answer you're looking for? Browse other questions tagged power-supply ac dc wire power-engineering or ask your own question. I want to build a DC powered computer, what are the gotchas, where are the parts? Why the delay between transformer failure and power outage? What are the differences between an AC and DC coil relay? What are these coils on transmission lines? What is the use of SENSE + and - in a PSU? What are the symbols in the picture? Difference between ideal and practical ammeter?